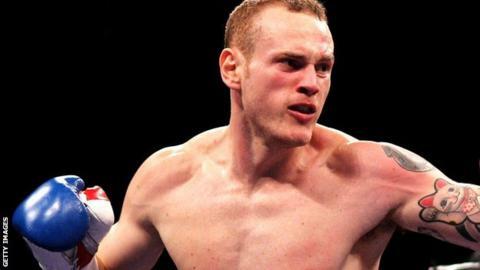 George Groves has pulled out of his WBO world title fight against Robert Stieglitz on 5 May because of injury. The British and Commonwealth super-middleweight champion was injured while training in Northern Cyprus. “I am truly sorry to everyone who will be affected by this,” said Groves, 24. Groves, who was set to fight the 30-year-old Russian-born German in Erfurt, Germany, added: “We tried to work through it, but soon realised I wouldn’t be able to perform the training needed to prepare for this fight. The Londoner had to pull out of a second defence of his British and Commonwealth titles against Scot Kenny Anderson last month because of a back injury. Groves had an impressive 2011, first beating Olympic gold medalist James DeGale in May to take the British and Commonwealth super-middleweight crown, then defending it with a second-round knockout of Paul Smith at Wembley Arena in November. The bout with Groves was to be Stieglitz’s sixth defence of his WBO belt. The champion has lost two of his 43 previous fights.